Finally … a single-malt beefy enough to stand up to oak on its own stills, and Auchentoshan Virgin Wood wins. There will be no roommates for this dram. Auchentoshan Virgin Oak absolutely refuses to share it’s barrels with any other spirit—this means no ex-Bourbon or Sherry casks, and no high-faloot’in fancy-pants wine barrels either. This Lowland single-malt spends all of its days in brand new charred oak. Sure, there are a few other Scotch Whiskies experimenting with new casks, but remember that Auchentoshan is the only distillery in Scotland that triple-distills it’s spirit, so that lovely malty goodness enters the barrel at 162 proof (yep … that’s 81% ABV), and that makes a difference here. Re-using casks that have been used to age other beverages is sometimes called “seasoning” the casks because not only does a hint of the previous resident remain in the barrel to flavor the new stuff, but the esters and vanillin in the wood (the stuff we are trying to get at) are loosened up a bit. Well, that unusually high ABV is mighty powerfully stuff that jumps into the casks saying, “Seasoned barrels? We don’t need no seasoned barrels!” That sweet, powerful spirit gets down into the grain of that new wood better than most and releases all of that wonderful, mysterious oak-tree-magic that we all love, and gives Auchentoshan Virgin Wood more than a leg up on the competition. By the way … Auchentoshan Virgin Wood is a limited edition that they have been tinkering around with since the turn of the century. Once it’s gone for the year, that’s it. Triple distillation is not the only unique process practiced at Auchentoshan. The vast majority of distillers ferment their malt in large, stainless steel tanks. Using steel tanks during this step makes the process predictable and consistent, so no worries. At Auchentoshan they ferment in smaller, Oregon pine tanks which require constant attention and yield a slightly different character with each batch. 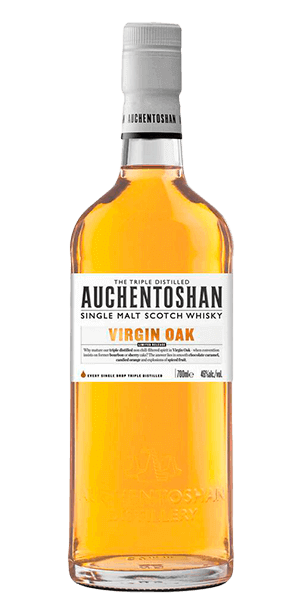 What does Auchentoshan Virgin Oak taste like? The Flavor Spiral™ shows the most common flavors that you'll taste in Auchentoshan Virgin Oak and gives you a chance to have a taste of it before actually tasting it. Creme’ Brûlée, vanilla, and … is that a hint of apple and ginger? Vanilla and cinnamon, with butterscotch and a bit of tart fruit … kiwi and green apple. Clean, sweet, and light with a bit of spice when next you inhale. It is an outstanding, rich, Glasgow's Malt Whisky with a rich birth; while a rich life leads to a delicate & rich death with a hint of malt, pine & spice. To me, this is the perfect dinner whisky. It has a wonderful flavor and finishes velvety smooth. If I'm looking for a kick in the face smokey whisky, this is not it, which is why I think it would be perfect for accompanying dinner. There are absolutely zero bad or harsh flavors in this. You get the fruit and the oak and it has an apple after taste that is very pleasant.